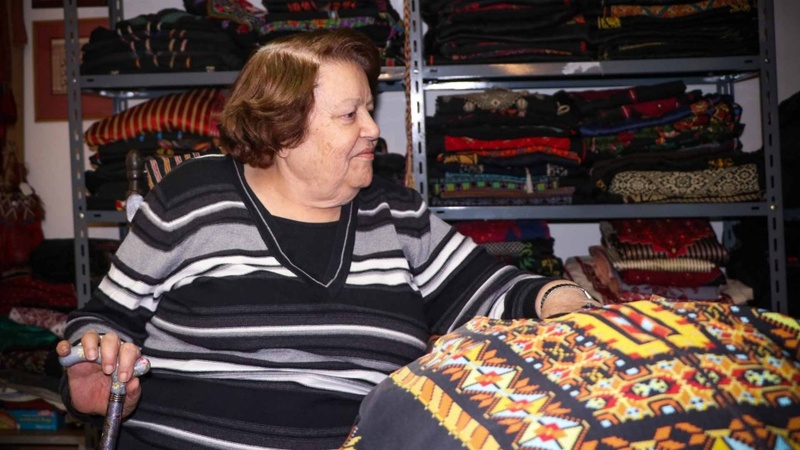 Raised in Bethlehem, a famous center of Palestinian embroidery, Widad Kawar grew up seeing women from the villages around Jerusalem come to Bethlehem to buy materials from embroidering on market day. They wore incredible dresses, richly embroidered to mark their villages of origin. But after the 1948 war, when hundreds of thousands of Palestinians fled into exile, Kawar knew that something urgently needed to be done to rescue dying heritage. When she started her collection, she was only a teenager. “I took not even pieces, but fragments,” she said. “But it grew and it grew.” After the 1967 war displaced even more women, Kawar set out to collect costumes from every single region of historical Palestine. Soon, she began traveling to refugee camps to interview women about their dresses. Today, the Widad Kawar collection in Jordan is considered the largest collection of Palestinian dresses in the world, a library in cloth, saving invaluable information about Palestinian life before the diaspora. Most of these dresses are simply folded in piles and kept in the basement of Kawar’s home. “There was so much identity in a dress for a woman—especially since these dresses were made for their weddings,” she said. “Each dress has many, many memories, and the woman would have loved to pass her dresses on to her daughter. And she wanted to preserve her heritage—this is important to understand.” Now, thanks to Kawar, those dresses will not disappear.